Acid is one of the key contributors to tooth enamel erosion. In the past it was believed that sparkling water might weaken your tooth enamel because carbonation of any kind is more acidic. However, recent research has shown that, despite the slightly higher acidity levels of sparkling water, carbonated water and still water have almost the same effect on tooth enamel. What does this mean? This means that even though sparkling water is a bit more acidic, it doesn’t do any more damage to your teeth than regular water. 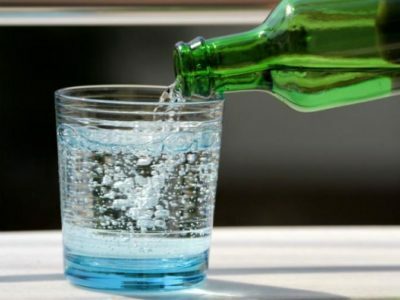 In fact, sparkling water is a great, healthy alternative to sugary sodas and drinks. The bubbles of sparkling water can help to satisfy your soda craving. Of course, you shouldn’t only drink sparkling water. Regular, fluoridated water is still the best option to keep hydrated. Additionally, the fluoride in regular water helps protect your teeth against cavities and clean away bad bacteria. Sparkling waters come in many flavors. Pay attention to the type of sparkling water you drink. Citrus-flavored waters will naturally have a higher acidity level and may eventually cause damage to your enamel. To avoid damage, drink these beverages with a meal and in one sitting. Don’t sip them throughout the day as this can lead to continuous acid attacks on your teeth and a higher chance of tooth decay. If you choose to drink sparkling water, it’s best to avoid brands with added sugar. Once sugar is added, it’s technically not sparkling water anymore, it’s more like a soda. Sugar-infused drinks contribute to cavities, so it’s best to avoid them if possible. While it’s fine to drink sparkling water, do so in moderation. Remember that regular water is the best beverage to drink for your teeth. Regular water doesn’t lead to cavities and actually helps protect your teeth against the development of cavities.